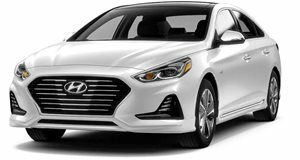 The Hyundai Sonata Hybrid offers a less stylish interior than many of its counterparts, but is big on practicality, perceived quality, and ergonomics. Revisions for the 2018 model see the touchscreen brought into easier reaching distance, with all buttons and knobs large and distinct enough for ease of use. Seating is comfortable, with leather upholstery, 8-way power adjustment for the driver with lumbar support, 6-way passenger power adjustment, heating and ventilation, and memory function thrown into the mix on the Limited model. Rear seats offer ample space, even for adults, though only the Limited model offers split folding seats. LATCH anchors feature in the rear as well (2 lower, 3 upper tethers), and the rear is spacious enough to easily affix a child safety seat. The Hyundai Sonata Hybrid seats 5 adults very comfortably, though taller rear passengers might find headroom on the slightly cramped side of things. Leg and shoulder room is ample though, and the driver and front passenger are living lavishly with copious amounts of room. Comfort is one of the Sonata Hybrid’s highlights, with seating that remains comfortable for hundreds of miles at a time – particularly with heated and ventilated seats offered in the Limited trim. Ingress and egress is made easy as well by wide door apertures, though the sloping roof sees rear passengers needing to duck ever so slightly to get in without bumping their heads. The base Sonata SE Hybrid comes standard with a leather steering wheel and cloth upholstery and no option to upgrade to leather seating. The cloth is available in either beige or grey to suit your needs and stylistic desires, and is offset by ‘metalgrain’ accents throughout the cabin. Opting for the Limited trim sees the interior upgraded to feature woodgrain appearance accents and trimmings, and also equips the seats with a choice of three leathers – beige, grey, or Emerald Blue. On both trim lines, the upholstery colors are limited and the choice defined based on the exterior paint color you’ve chosen. A 7-inch touchscreen system is standard on both derivatives of the Hyundai Sonata, though the Ultimate Package on the Limited model upgrades the system to an 8-inch unit in size. The standard 7 inch setup features Android Auto and Apple CarPlay functionality, a rearview camera system, auxiliary input jacks, and six speakers on the SE, and equips HD Radio and SiriusXM satellite radio on the Limited model, while the Ultimate Package on the Limited model equips the 8-inch unit with a 10-speaker Infinity audio system with amplifier and subwoofer, navigation, and 3 years complimentary service to BlueLink Connected Car Services which respond to Alexa and Google Assistant. Also included with the Ultimate Package is wireless device charging for compatible smartphones and devices, while a USB port is standard in the rear of the cabin. The Hyundai Sonata Hybrid offers 13.3 cubic feet worth of cargo volume in the trunk – which is less than the 15.1 cu. ft. of the Camry Hybrid and the huge 16.7 cu. ft. on offer in the Accord Hybrid; but it still offers more than the 12 cu. ft. of the Ford Fusion Hybrid. In Limited trim, the 60/40 split folding rear seats do allow for longer item storage and expansion into the cabin. Getting items in and out isn’t all too difficult either, and when you have the standard proximity key on you, the hands-free power trunk lid standard on all Sonata Hybrid models makes for convenient loading when you’ve got your hands full and doesn’t require treacherous one-foot endeavors. Inside too, storage is generous, with a large center console, glove box, and door bins all offering great storage, and many other small storage areas located throughout the cabin.